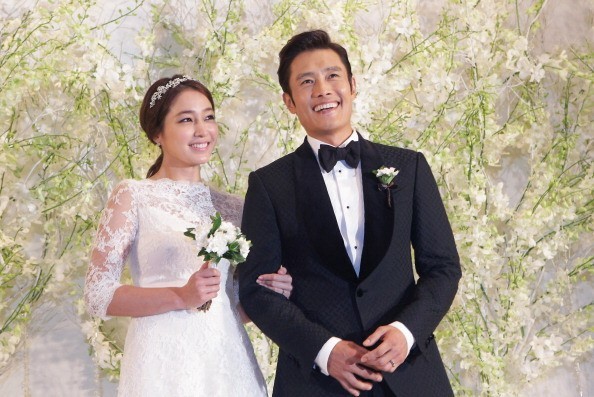 Newly-wed Lee Min Jung (L) and Lee Byung Hun all smiles at the wedding reception. As Lee Byung Hun's number one supporter, Lee Min Jung is sending her invitation to watch and support her husband's latest Hollywood film titled "The Magnificent 7" alongside Denzel Washington, Chris Pratt and Ethan Hawke. During a press conference of "The Magnificent 7," Min Jung said the Hollywood film is perfect for all ages. "It's a western story taking place in the old wilderness, but it's been re-interpreted into a more modern film that's fun and satisfying. It's a film that all families can enjoy in theaters at Chuseok, so please come and see it," she said as quoted by Allkpop. "The Magnificent 7" is a remake of a 1960s film of the same title. Other stars who will share the screen with Byung Hun include Vincent D'Onofrio, Manuel Garcia-Rulfo, Martin Sensmeier, Peter Sarsgaard and Haley Bennett. Byung Hun plays the role of Billy Rocks who is an assassin. The Hollywood film previously premiered at the 2016 Toronto International Film Festival on Sept. 8. Meanwhile, "The Magnificent 7" will hit the theaters worldwide on Sept. 14. On the other hand, Byung Hun is also set to star in a film titled "Master." He will be joined by Kang Dong Won and Kim Woo Bin for the movie which is slated to hit the big screens in December, Soompi noted. Byung Hun takes the role Chairman Jin who is a con artist. The upcoming film "Master" is directed by Jo Ui Seok and is considered the most-studded Korean film this year having these three gentlemen for the crime action film. Dong Won will lead the investigative team as Kim Jae Jyung, while Woo Bin will serve as Chairman Jin's brain. Meanwhile, watch the first teaser of the highly-anticipated movie "Master."